This forum topic is for the purpose of coming together to identify Romanian militaria. Please post your items here. A very large shoulder sleeve patch in bullion for a Munitions transportation snow sled driver for the 2nd Artillery Regiment. The sled looks like it has boxes behind the driver for carrying artillery shells. I have photographs of WW1 and WW2 soldiers wearing shoulder sleeve patches. However, I beleive that this type of insignia, shoulder sleeve patches, are extremely rare and perhaps not officially authorized. This patch is unknown to me and looks to have been made in WW1 or the 1920's. I hope this guy got hazardous pay. Can any one identify this badge :? : I have seen this badge with and without crown at the top. The letter are "S.R.R." I think that it may be for an NCO School. Silver badge with very nice enamel. Circa 1930's. Here is another badge that is unknown to me. School for Ensigns or Lieutenants :? : Note the star and chevron insignia on the badge. This is a very early made pin back badge. Possibly of WW1-1920's mfg. 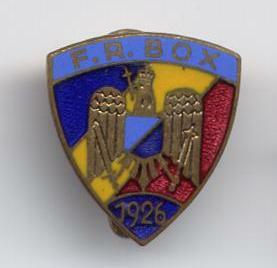 Could it be a variation of the badge of Straja Ţării? There are 5 variations that I know of. Silver minuture badge applied over a silver Order of Ferdinand. Could you tell me the price range of this badges? Here are the other 2 badges that I describe previously. The one in all silver with many silver hallmarks and has a miniture badge applied over the Ferdinand cross. Very nicely made Jeweler piece made by Joseph Resch Fiul Bucharest. Was this piece reserved for Royal members ????? Unknown patch. Very large with bullion wire embroidery. At the top are the letters "F.R.BO.X." and the date "1926"
Can anyone identify this piece ? Unsual center shield. I wonder if it isn't in fact "F.R.BOX" which might stand for Federaţia Română de Box (Romanian Boxing Federation). Even today they use the same acronym in the address of their website: www.frbox.ro (even though it does not seem to work). Interesting WW2 helmet painted black with an unusual skull and cross bones insignia. Any one have an idea who wore this helmet and what this insignia is for ? Close up view of painted insignia.